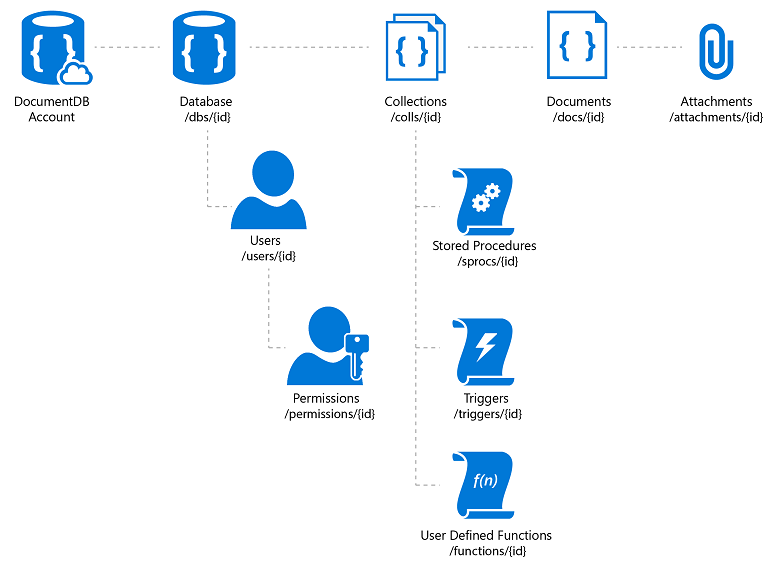 Azure Cosmos DB is document based and when we refer to documents we mean JSON objects that can be managed through the Document API. If you are not familiar with the Azure Cosmos DB and its resources, here is the relationship between them. What do you need to follow along with this tutorial? In case you don’t have an Azure Subscription, simply install the Azure Cosmos DB Emulator with which you can develop and test your DocumentDB based application locally. Are you ready? Let’s start! I have already built an application that makes use of the DocumentDB API and the Azure Cosmos DB Emulator. Clone the repository from here and either open the solution in Visual Studio 2017 or run the following command to restore the required packages. Apparently the project is built in ASP.NET Core. Build the solution but before firing it up, make sure the Azure Comsos DB Emulator is up and running. 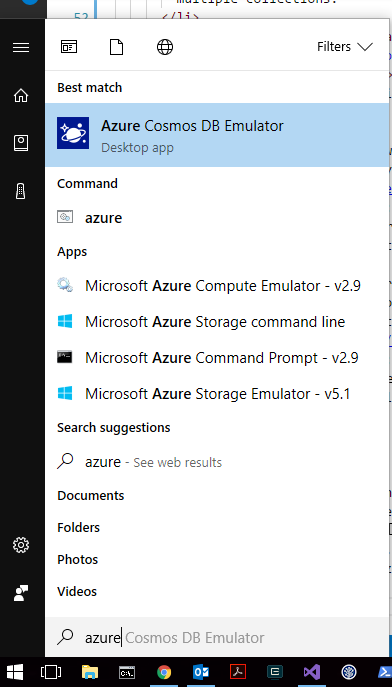 In case you don’t know how to do this, search in the apps for Azure Cosmos DB Emulator and open the app. It will ask you to grant admimistrator permissions in order to start. When the emulator starts, it will automatically open its Data Explorer on the browser at https://localhost:8081/_explorer/index.html. If it doesn’t, right click on the tray icon and select Open Data Explorer... Now you can run the app and initiate a DocumentDB database named Gallery and two collections, Pictures and Categories. The initializer class which we ‘ll examine in a moment, will also populate some mock data for you. At this point, what matters is to understand what exactly a collection and a document is, throught the emulator’s interface. Before examine what really happened on the emulator’s database, notice that the app is a Photo Gallery app. Each picture, has a title and belongs to a category. Now let’s take a look at the emulator’s data explorer. You can see how a collection and a JSON document looks like. A collection may have Stored Procedures, User Defined Functions and Triggers. A JSON document is of type Document and can be converted to an application’s domain model quite easily. Now let’s switch to code and see how to connect to a DocumentDB account and initiate database and collections. Before creating a database you have to check that doesn’t already exist. The DatabaseId parameter is the database’s name and will be used for all queries against a database. When creating a database collection you may or may not provide a partitionkey. 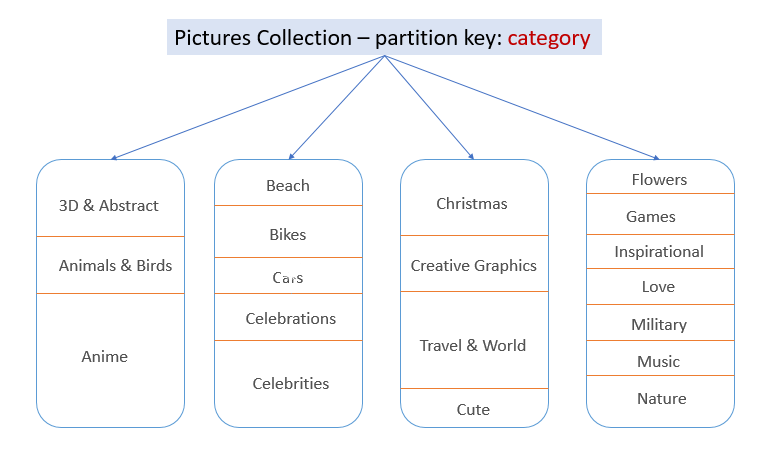 Partition keys are specified in the form of a JSON path, for example in our case and for the collection Pictures, we specified the partition key /category which represents the property Category in the PictureItem class. Partitioning in DocumentDB is an instrument to make a collection massively scale in terms of storage and throughput needs. Documents with the same partition key values are stored in the same physical partition (grouped together) and this is done and managed automatically for you by calculating and assign a hash of a partitionkey to the relative physical location. In order to understand the relationship between a partition and a collection, think that while a partition hosts one or more partition keys, a collection acts as the logical container of these physical partitions. Documents with the same partition key are grouped together always in the same physical partition and if that group needs to grow more, Azure will automatically make any required transformations for this to happen (e.g shrink another group or move to a different partition). Always pick a partition key that leverages the maximum throughput of your DocumentDB account. In our case, assuming thousands of people uploading pictures with with different category at the same rate, then we would leverage the maximum throughput. On the other hand, if you pick a partition key such as the DateCreated, all pictures uploaded on the same date would end up to the same partition. Here is how you create a collection. Now that we have created the database and collections, we need an elegant way to CRUD against them. The requirements for the repositories are the following. Having these requirements in mind, I used the following repository pattern: At the top level there is a generic interface named IDocumentDBRepository. There is a base abstract class that implements all of the interface’s methods except the InitAsync. Don’t worry about the implementation, we ‘ll check it later on the CRUD section. Last but not least, there are the concrete classes that can finally target specific DocumentDB database. In our case, we want a repository to target the Gallery database and its collections we created on the first step. When we want to CRUD agains a specific collection we call the InitAsync method passing as a parameter the collection id. Make sure you register your repositories in the dependcy injection on the Starup class. It is more likely that you wont need more that two or three DocumentDB databases, so a single repository should be more than enough. The Index action of the PicturesController reads all the pictures inside the Pictures collection. First of all we get an instance of the repository. As we previously saw, its constructor will also initiate the credentials to connect to the Gallery DocumentDB database. The Index action may or may not receive a parameter to filter the picture results based on their title. This means that we want to be able either query all the items of a collection or pass a predicate and filter them. Here are both the implementations. Here you can see for the first time, how we convert a Document item to a Domain model class. Using the same repository but targeting the Categories collection, we will be able to query CategoryItem items. The documentDB initializer class has the following method, that registers a Pre-Trigger type. One important thing to notice here is that a trigger is registered on a collection level (collection.TriggersLink). Now when we want to create a document and also require a trigger to run, we need to pass it in the RequestOptions. Here is how you create a document with or without request options. And here is how the CreateAsync action creates a PictureItem document. The picture item instance parameter, has a Category value which will be used as the partition key value. You can confirm this in the DocumentDB emulator interface. Each document has an AttachmentsLink where you can store attachments, in our case we ‘ll store a file attachment. Mind that you should avoid storing images attachments but instead you should store their links, otherwise you ‘ll probably face performance issues. In our application we store the images because we just want to see how to store files. In a production application we would store the images as blobs in an Azure Blog Storage account and store the blob’s link as an attachment to the document. Here is how we create, read and update a document attachment. The CreateAsync action method checks if there’s a file uploaded while posting to action and if so, creates the attachment. Since you create an attachment to a collection that uses partition keys, you also need to provide the one related to the document at which the attachment will be created. When reading a document, you can either get a domain model instance or the generic Document. // Could be something like this.. The comments show how you would do manually the mapping for each property. But we figured out a more generic way didn’t we? Here’s how the EditAsync action reads a picture document. In case you don’t want to use AutoMapper, you could achieve the deserialization using Newtonsoft.Json or the dynamic keyword. The following three statements will return the same result. Updating a document is prety simple. Mind though that in case you change the value for the partition key, you cannot just simply update the document, since the new partition key may be stored in a different physical partition. In this case as you can see in the EditAsync POST method, you need to delete and re-created the item from scratch using the new partition key value. Like most of the methods, depending if the collection created using a partition key or not, the DeleteItemAsync may or may not require a partition key value. If you try to query a collection that requires a partition key and you don’t provide one, you ‘ll get an exception. On the other hand if your query indeed must search among all partitions then all you have to do use the EnableCrossPartitionQuery = true in the FeedOptions. A collection may have stored procedures as well. Our application uses the sample bulkDelete stored procedure from the official Azure DocumentDB repository, to remove pictures from the Pictures collection. The SP accepts an SQL query as a parameter. First, let’s register the stored procedure on the collection. 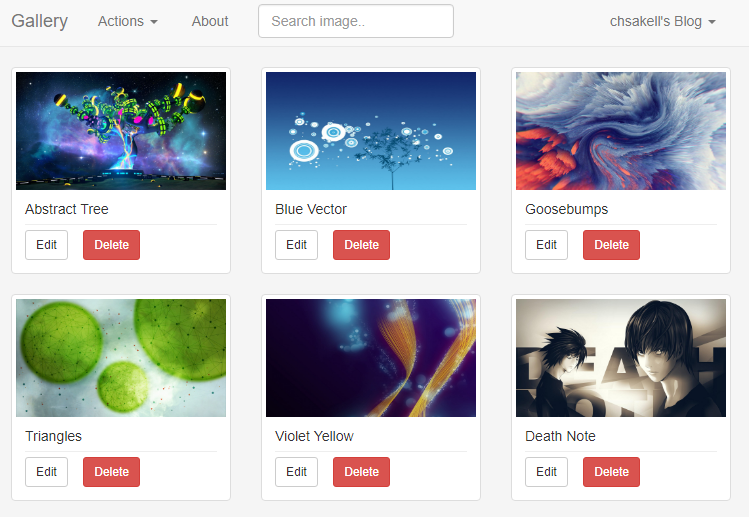 The DeleteAll action method deletes either all pictures from a selected category or all the pictures in the collection. As you ‘ll see, the query passed to the bulkDelete stored procedure is the same, what changes is the partition key that can target pictures on an individual category. Our application registres the toUpperCase UDF that returns a value in upper case. The FillCategoriesAsync method can return each category title in upper case if required. That’s it we finished! 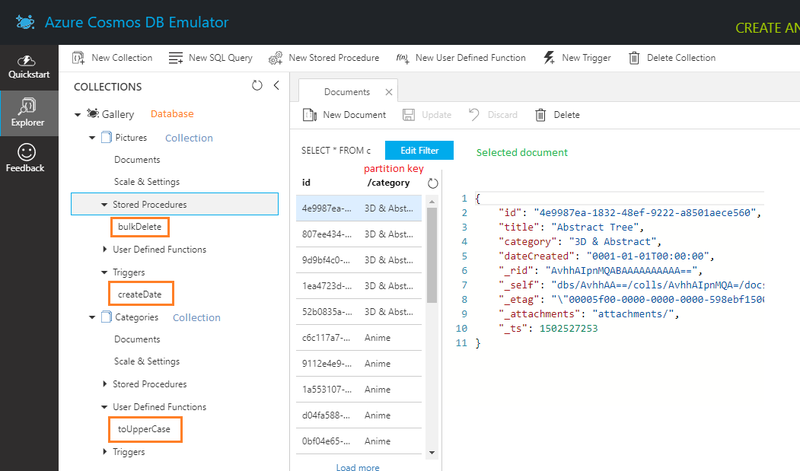 We have seen many things related to the DocumentDB API, starting from installing the Azure Cosmos DB Emulator and creating a Database with some collections to CRUD operations and generic data repositories. You can download the project for this post, here. Nice article. Just wondering why Automapper instead of simple Newtonsoft json deserialize? Hi Leszek, thanks for your comment! AutoMapper is usually good in case you to map certain property values to something different (usually the POCO classes are more complex than the PictureItem..). I will make sure to update the post and give these options as well. Excellent write up Chris. Now everything is clear as day regarding the partitionkeys part of cosmosdb. Keep up the good work!